Wrap-around bolster design allowing operator to rotate body comfortably in applications such as pavers and rollers. 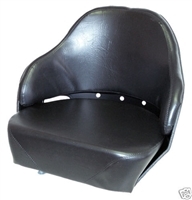 This Heavy Duty Bucket Seat is a space saver and is suited for heavy duty off road equipment providing the maximum in comfort, strength and safety. This seat has been designed and developed to help meet the needs of customers that are looking for a comfortable, economic and spacing saving seat.